We are having so much fun reading Dr. Seuss stories this week! Today we read Fox in Socks and everyone wore their crazy or silly socks (except me cause I forgot and I was really late this morning, because I had to help tow my hubby's van out of the drive way, but that is another story, so I couldn't even go back and get my socks when I realized I forgot) But it was OK the kids forgave me! When we were done reading the story I took my favorite picture of the year! (We take lots of pictures during the year because we make each student a memory book with all of their pics, yes you read that right EVERY kinder gets a book filled with pics!) They turn out really cute but are A LOT of work especially if you wait to the end of the year to put them together, like I do! I will have to remember to take pics of them this year and share! Anyway here is our crazy sock picture! We are still working our word families during our RtI time and I have the group of kiddos that get them already. So I was looking for some games we could play on the SMART board. I went to SMART Exchange and found this great game! 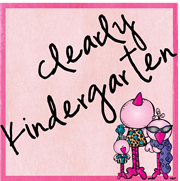 It is just like the one the fabulous Khrys at Keepin' It Kool in Kinderland posted about here for sight words. They LOVED it! We had to throw a small stuffed dog at the circles to pop them since I didn't have a Koosh ball today, but it worked, most of the time. Here is the screen that they throw the dog ball at. When they hit one of the circles a new screen like this comes up. Then I had the kiddo come up and move the word family part down and write the beginning sound to make the word. If we hit the same circle again they had to think of another word that would fit in that word family and write it underneath. They were begging to play this game again tomorrow! I love when I find activities like that! Hope you can use it too! Click here for the link to the game on SMART Exchange. You have to have an account to download it but it is free to sign up! I LOVE making these kinds of SMARTboard games!! Love the graphics in this one! GREAT find! After seeing this I REALLY wish I had a SMARTboard!! Don't you just love your SmartBoard? Our students love lessons using it!! Making end of the year photo book for each kiddo is a great idea! I always just gave them the pics in a zip-lock bag with their name on it for parents to add to their photo book but it makes it more personal to make one and give it to each kid. The socks pic is super cute! That really looks like a fun game! I wish I had a SMARTboard! :( Love your sock picture. It's a great way to show all the socks and no faces! Thanks for stopping by my blog. I love your blog design!The sock picture is just too cute. I found your wonderful blog through Zoom Zoom's newish primary grade blogger list. I love the photo of the kids wearing their crazy socks in honor of the book, "Fox in Socks". The SMARTboard is such a wonderfu invention for teachers. Thanks for sharing the link to the SMART exchange resource. We teachers are so resourceful! If we don't have a Koosh ball handy to throw at the SMART board, substitute with a stuffed animal! Thanks for sharing.